Over at CES this week, Asus took the wraps off a pair of new monitors, including a direct-lit LED 4K HDR display which the company claims delivers a breath-taking picture in terms of detail and brightness. 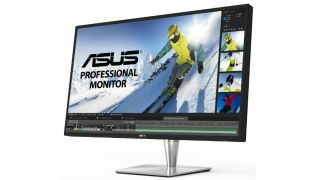 The 4K monitor in question is the ProArt PA32U, and as the name suggests it’s aimed at professional use, sporting a full-array LED backlight (featuring 384 individual LED zones), with Asus boasting that this enables a wide range of dynamic luminance for a richer image – and a more-than-impressive peak brightness of 1,000 nits. This 32-inch display also uses quantum dot technology for a wide color gamut, meaning it covers 99.5% of Adobe RGB and 100% sRGB, as well as 85% Rec. 2020 and 95% DCI-P3. In short, we are talking highly accurate colors for image and video work. In terms of connectivity, you get a pair of Thunderbolt 3 ports, meaning the monitor can be daisy-chained up to other 4K displays if you want to get really serious in the productivity stakes. This display also comes with Asus ProArt Calibration Technology, which provides all your calibration needs including color tuning and uniformity compensation, with profiles saved on the actual monitor’s hardware so you don’t have to recalibrate when the display is hooked up to another PC. Asus also revealed the new Designo Curve MX38VQ, a bigger monitor which tips the scales at 37.5-inches and offers a resolution of 3840 x 1600. It’s an ultra-wide (21:9) IPS panel and as the name suggests the display is curved with a 2300R curvature – every point on the screen is equidistant to the viewer’s eyes, the company notes, making for a truly immersive experience when gaming or watching movies. There’s built-in wireless charging (of the Qi variety) in the monitor’s stand, so you can juice up your phone while using the PC, plus there’s also a pair of 8W stereo speakers.